Cream together butter and peanut butter. Add sugars; cream well. Stir in 1 egg, vanilla, and salt. Add baking soda to the flour, and gradually add to the other ingredients. Roll dough into 3/4-inch balls. Dip balls in white of one egg, and roll in chopped peanuts. Place on cookie sheet 1-inch apart, and press down center of each cookie with thumb. Bake in preheated 350-degree oven for 10 to 15 minutes or until done. Cool slightly before removing from pan to rack. Fill center of each cookie with strawberry or grape jelly. Yields 3 to 4 dozen cookies. 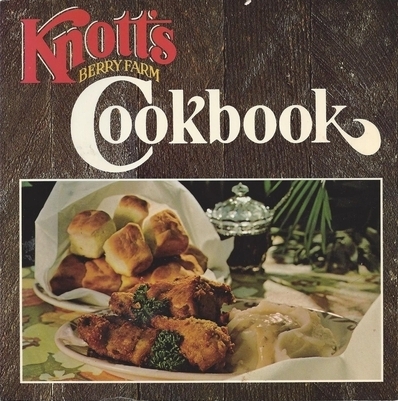 Note - Knott's Berry Farm, located in Buena Park, California, began in the 1920s as a fruit stand to sell Walter Knott's berry crops from his 20-acre farm. In 1934, Walter and Cordelia Knott opened a chicken dinner restaurant next to the fruit stand. By 1940, the little restaurant was selling 400,000 dinners a year. Mr. Knott opened a handful of diversions to entertain customer waiting in long lines to enjoy Cordelia's fried chicken, biscuits, green beans, and famed pies. By 1976, Knott's Berry Farm featured more than 100 rides and amusements over 150 acres, and boasted 3,000 employees.